The foundation is a vehicle for individuals who share the bond of friendship to use their collective commitment, resources, and energy to improve the human condition and protect the environment all over the world. The foundation identifies and supports significant environmental projects, serving as a funnel so that contributions from friends, colleagues, and other donors go directly to the projects with no deductions for overhead expenses! 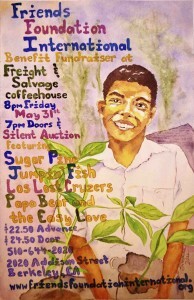 Tonight’s show is a benefit for the foundation featuring four fun bands, Los Lost Cruzers, Sugar Pine, Jumpin’ Fish, and Papa Bear and the Easy Love. Come and join the fun, for your sake and the sake of Friends!